Thinking of Hiring Alicia? Pricing here. Download 13 Prime Principles of Plot to Start Your Story Now! Do You Need an Editor? What Kind? Some Irreverent Thoughts. Story (a/k/a- content or main) editing: Identifies problems in the story structure including things like motivation, logic, conflict, and drama. This editor will diagnose and suggest fixes for issues in plot, character, structure, scene, sequence. Line-editing: Identifies and fixes prose problems, particularly on the sentence and paragraph level. That means things like ineffective paragraphing, vague sentences, generic descriptions, opaque explanations, missed opportunities for character deepening. This can be very time-consuming and most likely to result in conflict, because this very much involves the author voice. A great line editor can work within your voice, to help you refine and perfect it and apply it here to this story. Copy-editing: Rectifies grammar mistakes if they weren’t fixed in the line-edit, identifying potential uh-ohs (like the hero has blue eyes in chapter X and green eyes in chapter Y), revising over-used or duplicated words and phrases, questioning and checking research, standardizing formatting (like making sure chapter headings are all consistent), applying “house style” (like what is customarily capitalized and punctuated in “Ph.D.”). Proofreading: Finds and fixes typos, duplicated words, missing words, formatting errors. Probably most writers do need a copy-edit and proofread just because those involve fairly arcane decisions and training, and it’s next to impossible to do that close a reading of our own work. But not all writers need story-editing. Not all need line-editing. I would say I don’t actually need line-editing, as I’m pretty strong on the prose level. But I can never tell when the tension has dropped in my plotting, or when I love characters a tad too much so that readers will be alienated. So at the story level, I often need help, which is why I have a great critique group, and brainstorm a lot with several discerning friends, and why I’d be likely to hire a content editor. If you are looking for an edit that takes into account every one of those levels, then you might be looking at something like 15 cents a word (so $15,000 for a 100,000 word book) and a month’s turnaround. All-over editing is a lot of work and requires a lot of skills, so it doesn’t come cheap and it won’t happen quickly. SO…. you can save money by figuring out the sort of editing you need. In other words, being very clear when you’re paying someone to “edit” exactly what level of “editing” you’re asking for. And depending on your own strengths and weaknesses, you might well be capable of successfully taking on certain aspects of the editing process yourself. Or if you’ve already been through a total edit, you might have learned enough about your own abilities that you can pinpoint exactly what you need (and in that case, you might hire someone to work by the hour, rather than by the word). And not all writers need every level of editing! Great storytellers are not always great writers. But a great storyteller might not need a content editor– she already has good “story grammar,” knowing how to pace and dramatize and characterize. She might need help, however, making the prose match the story. ‘Wordsmiths’ might not need much line-editing, as they already experiment and edit sentences as they write. They might, however, benefit from story-editing, because they can’t always see the big picture of plot and character and scene. FOREST EDITING, OR TREE EDITING? If in a content edit I notice things like, say, that the mystery doesn’t have enough clues, or the hero’s anger isn’t sufficiently motivated, those really do have to be fixed before a copy edit can be done. The draft has to be ready to go before copy editing as there will be material added. As soon as I start concentrating on the words and sentences, I lose a sense of the big picture. So a real edit would require a second pass after the issues with content were addressed. Line and copy-editing is more the “trees”– the presentation and prose. In traditional publishing, the main or content editor goes over the manuscript early, asks for revisions, and then only when revisions are approved, passes it on to a line editor who works with the sentences and paragraphs. Sometimes it will then go to a copy editor, then the manuscript would go back to the author (who often will “stet” or reverse much of what the copy editor did ), and then after the ms is typeset and formatted, the proofreader has at it. Not many publishers have that many editors anymore– frankly, these days, we’re lucky to get a decent copy edit– but that old process did recognize that each of those is a separate task. Now many authors hire free-lance editors before they even submit a manuscript to a traditional publisher. And authors who want to go the route of independent publishing often hire one or more editors to make the book more publication-worthy. If I were thinking of hiring an editor, first I’d really think about what I needed from an editor. I’m worried about content: Maybe I think my plot might be too simple or too complex… or the book is twice or half as long as it’s meant to be. Or my readers have complained that my characters are unlikable or my events are implausible. In that case, I’d hire a “big-picture” content editor and ask just for that– help with the plot, pacing, and characters. I’d be specific about my vision for the book, the emotion I want to engender in the reader, the category of the book (that is, “traditional mystery” or “action thriller”– different categories require different sorts of development), and the desired length. The more the content editor knows what we want the book to be, the more direct the path to getting there. I’m worried more about the prose: Many of us, justifiably or not, think that by the time the book has passed through our critique groups and beta readers, we’ve probably got the content– plot, etc– where we want it. In that case, why not jump right to the line edit and hire an editor who is adept with sentences and paragraphing, who can help you discover and refine your own voice and embed that in your prose? Working with a good line editor will not just improve this story, but give you the skills and self-understanding that will help you write more sharply and subtly in the future. I’m more concerned with mechanical errors: Are you worried about grammar, punctuation, point-of-view breaks, sentence length, factual mistakes? A copy editor can carefully go over every page, looking for mechanical problems to fix. No matter what, I’d usually get someone else to proofread. The cheap way is to trade proofreading with another author. It’s so much easier to catch someone else’s errors! But a professional proofreader should catch not just “many” errors, but “most” (almost no one will catch “all,” not on a single read). DECIDE: WHAT ARE YOU ALREADY GOOD AT? WHAT DO YOU NEED HELP WITH? What do you think? Where do you need help? Where don’t you need help? Alas, we’re not always the best judges of our own work, but the more analytical and objective you can be, the better you can decide how to improve. Contact Alicia if you’re interested in hiring an editor of any kind. Sign up for my email newsletter for new craft-of-writing books and get a free plotting article! 3 Reasons to Join Alicia’s Writing Net! 3. Access to private plotting courses. 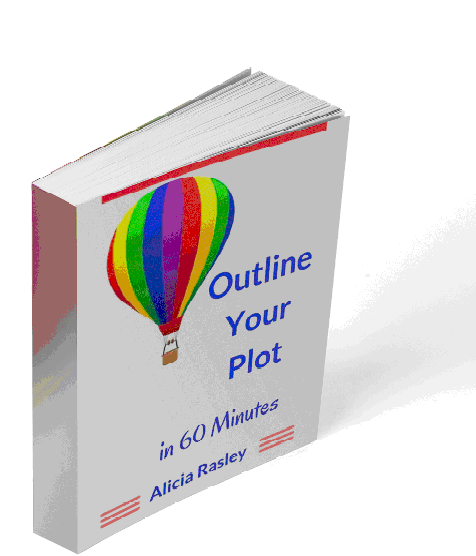 Outline Your Novel in 60 Minutes! Here's a great way to sketch out your story plot before you start drafting.